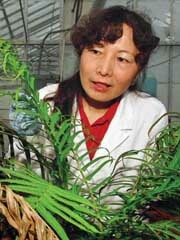 Lena Ma is a national leader in the emerging science of phytoremediation, which uses plants to extract contaminants from the soil. In particular, Ma has identified ferns as the ideal plants to extract arsenic. Wood homes, fences, decks and soil in Florida, and throughout the country, contain dangerous trace metals like lead, cadmium, arsenic and mercury. Cattle ranchers in Florida often used arsenic on their herds to combat fleas and other vermin. As a result of this activity alone, the state has more than 3,200 known sites contaminated by arsenic. “Over the past 20 years, the idea of using plants to decontaminate areas affected by trace metals has become more and more popular because it’s cost-effective and environmentally friendly,” Ma says. Ma’s research team found that the brake fern soaks up arsenic with staggering efficiency. They measured levels as much as 200 times higher in the fern than in contaminated soils where it was growing. In an example from a site contaminated by lumber treated with chromium-copper-arsenic solution, the soil had 38.9 parts per million of arsenic, while the fern fronds had 7,526 parts per million of arsenic. In greenhouse tests using soil artificially infused with arsenic, concentrations of the heavy metal in the fern’s fronds have reached 22,630 parts per million. Because the fern accumulates 90 percent of the arsenic in its fronds and stems, ferns could be grown on toxic sites, then the “above-ground biomass” could be transferred to a hazardous waste facility. During the past five years, Ma has secured more than $2.8 million from federal, state and private agencies, has published 50 refereed articles in top journals and was selected in 2003 as a Fellow of the American Society of Agronomy.